In the paragraphs below you will read the story of a Irish man of the 18th century who had everything anyone in the Western world would aspire for. Successful in business, liked sports and enjoyed a privileged social life. Different from the paradigm of the rich and powerful men whose affection to the material world blinds the spirit, Edmund Rice cared for the poor. Instead of building mansions to add to his prestige and social power, he chose to build schools and give a chance to the future of children neglected by society. The story below is broken into subtitles listed in the following index. Use the links in the index to jump to specific areas. Edmund was the fourth son of a family of seven boys and two girls. His father, Robert Rice, leased and worked hard on a 160 acres farm, an amount considered enormous to most tenant farmers who could lease only one or two acres. Edmund did very well at school, especially in bookkeeping. Because he was a Catholic, the law declared that he could not be a lawyer, doctor or engineer, or get elected to Parliament. He was limited to being a farmer on leased property or he could buy and sell farm products such as cattle or cloth made on the farm. In other words, he could be a merchant. 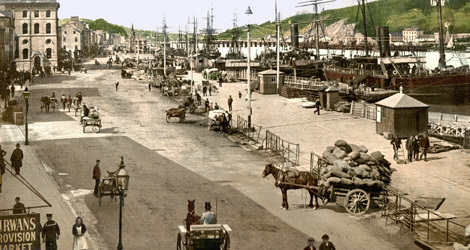 The quay at Waterford c. 1890–1900. At a very young age, he went to work for his Uncle Michael Rice, who was a merchant in the town of Waterford, about thirty miles south of Callan. Being a talented salesman, he convinced his uncle to supply directly to the ships, a move that made the business prosper. At the age of twenty-five he as an equal partner with his uncle. As a young man, he certainly knew how to enjoy life. He was a skilled horseman and had a great love for other outdoor activities, especially rowing and sailing. He was also keen on dancing and singing. 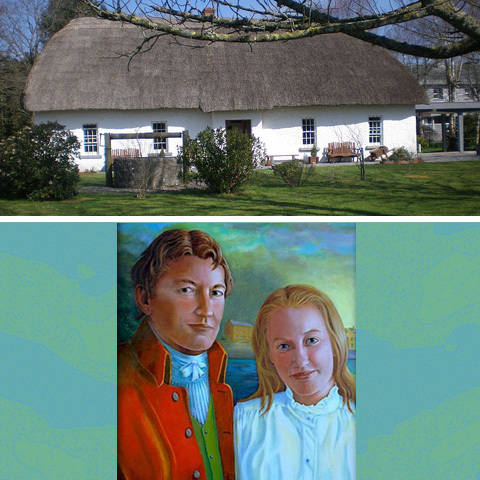 When he was twenty-two, he met the girl of his dreams, Mary Elliott, and married her a year later. Mary joined Edmund in his social life and in his outdoor activities. Four years later, on January 17, 1789, Mary was dead. 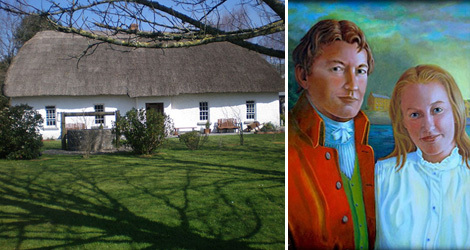 1 The cottage in which Blessed Edmund was born in 1762. 2 Edmund Rice and Wife. Mary sustained severe injuries when she fell from her horse and lacked the strength to fight off a fever that followed. Since she was pregnant at the time, she gave birth prematurely to their daughter. The shock of Mary's death led Edmund to weigh and measure his life more and more from a supernatural point of view. He turned to prayer more than ever before, a time when his former dreams and worldly ambitions were in tatters. "Gradually I learned to come to terms with being a true Christian through the mysteries of death and sorrow." Sorrow and grief gave him the strength to open his whole heart to Christ, whom he began to know as present and appealing to him in the poor. Edmund had always known that, behind the facade of his great commercial prosperity and full social life, there was another Waterford: the Waterford of the poor, the Waterford of narrow streets and dark alleys where miserable hovels were crowded together. Resuming his commercial activities with ever-growing success, Edmund was inwardly becoming more and more focused on religion and charity, developing a deeper interest in people and their problems of poverty, illness or lack of faith. As his works of charity became more widely known, he was selected trustee or administrator of several good causes. He also worked "unofficially" at restoring poor people back to their families, who had been imprisoned for debt. Known to the British soldiers whose ships Edmund outfitted, he was able to visit jails and accompany condemned prisoners to their place of execution. There were many similar situations due to the harsh laws of the times. "Real" lawyers were unwilling to work for these people, especially since the people could not afford their fees. On a very significant day, in 1793, in the course of doing business, Edmund fell into traveling with a Friar. They stopped at the same inn and shared a room for the night. The Friar, thinking he was asleep, arose and seemed to spend the whole night in prayer. This example had a profound effect on him. He resolved to untangle himself from business and lead a monk's life of retirement and prayer. He thought to move to Rome and join the Augustinians as his brother, John, had done just a year earlier. He thought it would be appropriate to put his talents to use as a lay-brother in that Order. Edmund had a matronly woman as a confidant in Waterford whom he always consulted on important matters. When he proposed to her that he might leave for Rome and join the Augustinians, she remarked, "Well, Mister Rice, while you go and bury yourself in a monastery, what will happen to these poor boys? Can't you do something for them? Perhaps something similar to what Nano Nagle's Presentation Sisters have done in Cork?" Her words went right to his heart and the clouds of uncertainty melted away. He saw that he was called to be a man to help youth in their ignorance and in their poverty. Having heard of the Presentation Sisters, he had become interested in their approach to education and the terminology that their foundress, Nano Nagle, had used in describing them: "Religious of Charitable Instruction." He reflected on how her Sisters seemed to divide their lives between an active life rescuing the poor from their plight, and a contemplative life ever-deepening their own love of God. Upon the advice of Father John Power, He proceeded to have an interview with Bishop Lanigan of Ossory (the Diocese in which Callan is located). He was surprised by the bishop’s willingness to see his plan proceed. The bishop had been considering the formation of a diocesan institute for the education of the Catholic poor. Edmund seemed to be an answer to the bishop’s own prayers. The bishop also encouraged Edmund to submit his plan to Pope Pius VI for his approval. Upon receiving an encouraging reply and a special blessing from His Holiness, he began to seek the opportunities to make his plans become reality. and the demands of the charitable works that he wished to continue. How to reconcile his talents and desires with the Will of God? How was he being called to use his resources to serve my people, especially the most poor? Especially the young? In late 1801 Edmund sold his business and began managing his assets toward the establishment of a school and with a view of possibly establishing a religious congregation. In January of 1802 he set up his first school in the New Street stable. It was roomy enough to provide space for three classrooms and had a loft for living quarters. Edmund hired two men to help him teach the boys that he encouraged in from the streets. The boys were understandably rough and turbulent. After a short time, the hired teachers left. He pleaded with them and offered to double their wages. Their reply was, "Not for all the money that you have, Mister Rice, would we try to teach such boys." Alone, middle-aged, untrained, and hardly experienced in the art of teaching. His students were wild and difficult. He prayed because he realized that his success no longer depended on business talents. The days turned into weeks. At last an answer came. Two young men from Edmund’s home town of Callan, Thomas Grosvenor and Patrick Finn, offered to join Edmund. They had interests similar to his, to travel off to Rome and join the Augustinians, but his brother, John, now working in Callan, persuaded them to spend some time with Edmund first. They wanted to try working and living with him, accepting no fee or other reward. John, had told them of his brother’s desire to begin a group of teaching religious men. The three men developed a daily horarium for prayer and followed a routine based on the Presentation Sisters. That was why Bishop Hussey initially referred to them as the Society of the Presentation. School was conducted in the manner with which Edmund was familiar as a business man - with practicality. Considering the condition of the boys, however, a considerable amount of compassion had to be included. They separated the students by newness and degree of improvement, rather than by age. Some of the older and more improved boys served as monitors, especially for copying and reading. 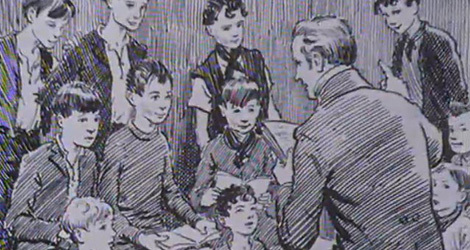 Edmund Rice teaching a class of young boys. 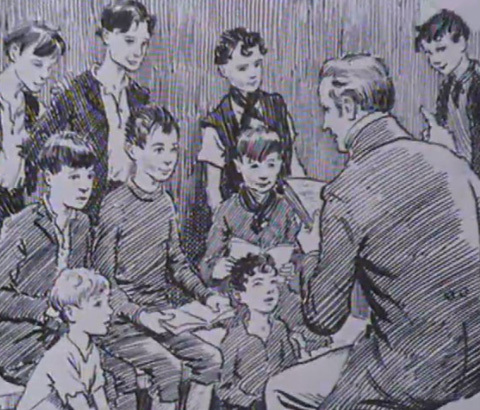 Edmund found that a number of the more improved boys showed interest in his personal library and allowed them to take a book home so that they could read on their own. He found later that a number of these boys used these books to read to their parents. In addition to the educational aspects of the school, the three men considered the spiritual lives of the boys. At the chime of the hourly bell they all stopped class work and recited a prayer. Every school day included a half hour of catechetical instruction. The complaints from they New Street neighbors quickly subsided as our organization of classes and the behavior of our boys improved. Their early success prompted the construction of a more complete facility just outside the walls of the city. Construction in June of 1802 for their first permanent facility. It was named Mount Sion by Bishop Hussey when the monastery was finished a year later. Shortly thereafter the Bishop died, and Father John Power was named Bishop of Waterford. Mount Sion, Edmund’s first permanent foundation at Ballybricken. This appointment truly seemed a blessing, since Father Power had been Edmund’s adviser during his earliest days of decision. On April 25, 1804, Father Power consecrated the completed Mount Sion facility. It provided space for the school, management quarters, a bake shop and tailor shop as well. In 1806 the second school at Carrick was established, about five miles up the river Suire. As in New Street, the students were initially very unruly and very difficult to manage, but with prayer and persistence, success was achieved. In 1807 Bishop Power was granted a large sum of money with a provision that some of it be used for the establishment of a school for the poor in Dungarvan, about eight miles southwest of Waterford. On August 15, 1808, on the Feast of the Assumption, in a most solemn manner, Edmund was joined by Patrick Finn, Thomas Grosvenor, John and James Mulcahy, William Hogan, Michael Power and Edmund Dunphy for a formal pronouncement of the three vows of religious life and became members of the Congregation of Religious Men of the Presentation of Our Blessed Lady. In response to Bishop Power's letter to Rome requesting a Papal Brief, they received encouragement and praise from the Sacred Congregation. They were also encouraged to proceed with drafting their own constitutions and submitting them for approval. Bishop Power accepted this response as sufficient grounds for them to make perpetual vows. 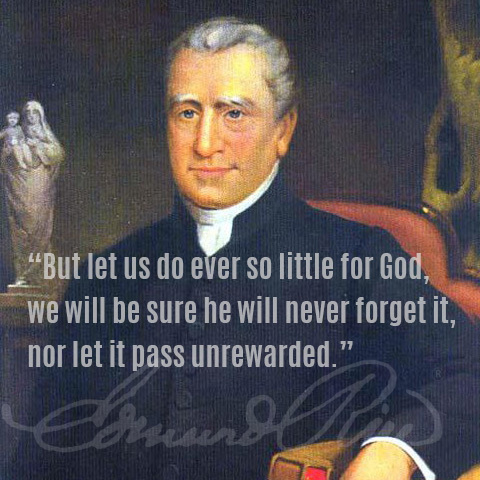 This was done on August 15, 1809, and Edmund became Brother Edmund Ignatius Rice. 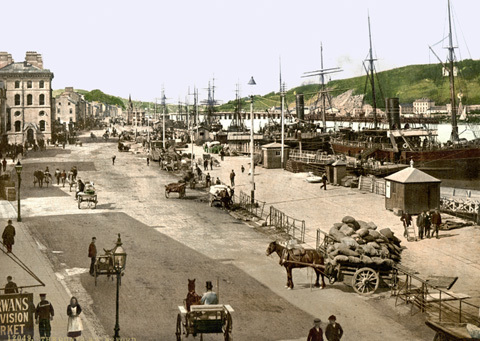 Bishop Moylan, of Cork, had visited them in Waterford during 1809. The bishop had been instrumental in assisting Nano Nagle in the foundation of the Presentation Sisters in his diocese. 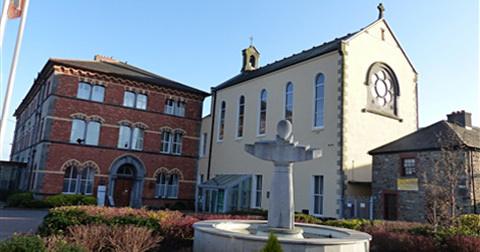 The bishop requested that they send Brothers to Cork for a school there. Br. Rice assured the bishop that he would, if he had the Brothers to spare. About the same time, Archbishop Daniel Murray of Dublin requested the establishment of a school in that city. Br. Rice knew that the Archbishop would be an invaluable ally and strongly desired to accede to his request. With God's grace, three additional members came to them around that same time. With their numbers sufficient to the task, and with Bishop Power's approval, two Brothers extended our work to Dublin in 1812. With this rapid expansion came the renewed interest in establishing their group as a distinct entity in the Church of Rome. In 1817 the Superiors of the eight communities of their growing institute came together to consider drafting the required Constitutions that would incorporate their unique character. 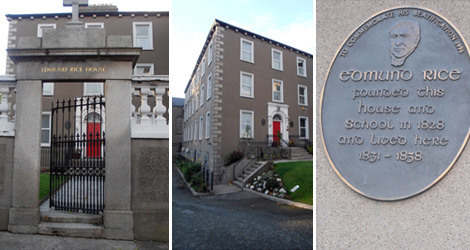 The North Richmond Street house and schools were founded by Edmund Rice in 1828 and the foundation stone was laid by the famous Daniel O’Connell. The brothers’ headquarters were housed here for many years. 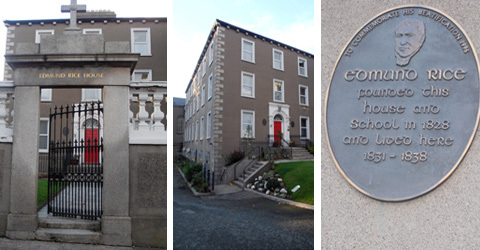 The present residence incorporated the original house built by Edmund Rice, who lived here from 1831 to 1838. Consideration was also made as to their relationships with local Bishops, especially on the requirement of their approval for transfers from one community, and diocese, to another. Br. Rice had always envisioned the institute reaching further and further from their beginnings in Waterford, and realized from experience that there would be a need to move Brothers freely from location to location. If a Brother could be selected as the overall leader of the Institute, rather than relying on the desires of the different local Bishops, the appropriate distribution of human resources would be more easily achieved. When they concluded their deliberations, the Superiors carried the results of the work to each of their communities. Over the next two years, community meetings and additional meetings of superiors produced Constitutions which were strongly supported by Archbishop Troy of Dublin and sent on to Rome in 1819. On September 5, 1820, Pope Pius VII signed the Papal Brief which gave approval to our Institute's first Constitutions, still largely based on that of the Presentation Sisters. In January of 1821 they received the Papal Brief through the hands of Father Peter Kenney, S.J. Now it was up to the Brothers of the Institute, to accept the Brief and the Constitutions that it represented. A few Brothers from the community in Cork, notably Michael Augustine Riordan, continued to live by the Presentation Rule. They continued as the Presentation Brothers. The following year, on January 20, Brothers of the Institute formally gathered at Mount Sion and accepted the Brief. The Presentation Brothers became an Apostolic Institute in 1889. In the first General Chapter that followed, Br. Rice was selected as the first Superior General of their Papal Congregation. As time went by and Br. Rice was able to regularly visit each of the communities, he realized that their Brothers were going to require additional funding, primarily for their own upkeep. Considering the varied conditions throughout the country and the two-fold nature of the schools, practical as well as religious education, there was a need for Catholic schools among those who were not as poor as those to whom we had been ministering. It seemed to Br. Rice that it would be appropriate to establish schools in which students were asked to pay for their education. Since this was in direct opposition with one of the clauses of our Papal Brief, they needed approval from Rome to make the adjustment. They made petition in 1823 and again in 1824 and received no reply. The decision was tabled until they met as a General Chapter in 1838. Although the Brothers did not accept the revision of our Constitutions to include pay schools, they did agree that two of the Dublin schools would accept pay from the students who attended there. In the intervening years the Institute continued to grow. In 1825 they established their first school outside of Ireland, in Preston, England. This was quickly followed by an opening in London, 1826, and eventually in Liverpool, 1837. Two Brothers set off for Gibraltar in 1835, and, although they had been invited to New South Wales, Australia, in 1832, Brothers were not sent there until 1842. Starting in December of 1831 and into 1832, ten years after they had officially begun as a Papal Congregation, they met in General Chapter to review and reconstruct their Constitutions. They had lived their lives as teaching Brothers and had taken on a distinct character. It was time to incorporate that in writing. In 1838, as Superior General, Br. Rice called a special General Chapter to announce his resignation. His age and health were preventing him from properly performing his duties. At the assembly his resignation was respectfully accepted. By the end of 1841 Br. Rice had become quite ill and confined to bed. In the following year he was having some mental difficulty and slipped in and out of a state of semi-coma. In August of 1844 he was failing rapidly and on the 29th of that month he was able to say a few thanks and good-byes to those attending him before slipping into his final rest. 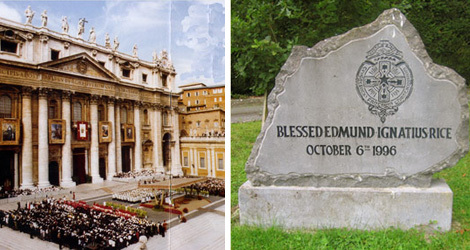 His Holiness John Paul II beatified Edmund Ignatius Rice on October 6, 1996, in St. Peter's Square. 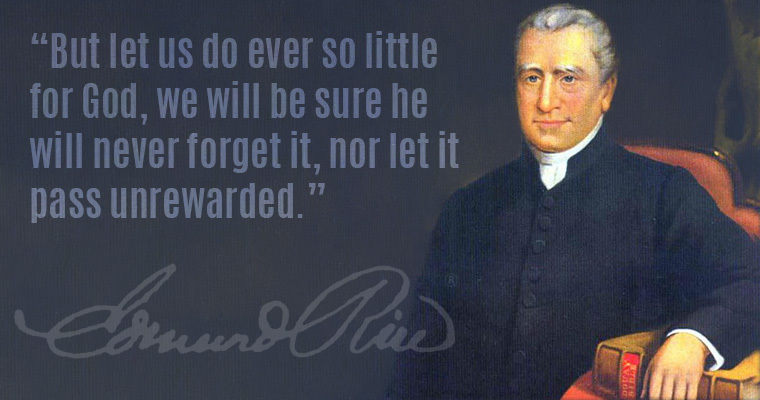 Blessed Edmund Rice was beatified after the Church investigated and recognized a medical miracle that was the result of people praying to Edmund Rice for his intercession with God. 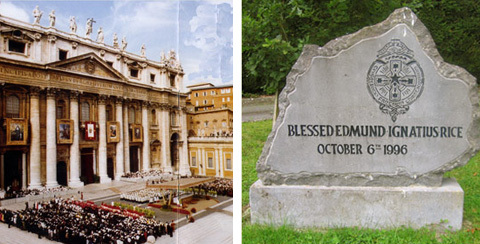 Edmund Rice was Beatified in Rome on 6th October 1996. Nearly 5,000 Irish people were in Rome to attend the beatification of Brother Edmund Rice. They were joined by another 2,000 who have came from Christian Brothers schools and communities in six continents. Today the Edmund Rice Christian Brothers and the Presentation Brothers serve God and the poor and marginalized on six continents. His Holiness John Paul II.